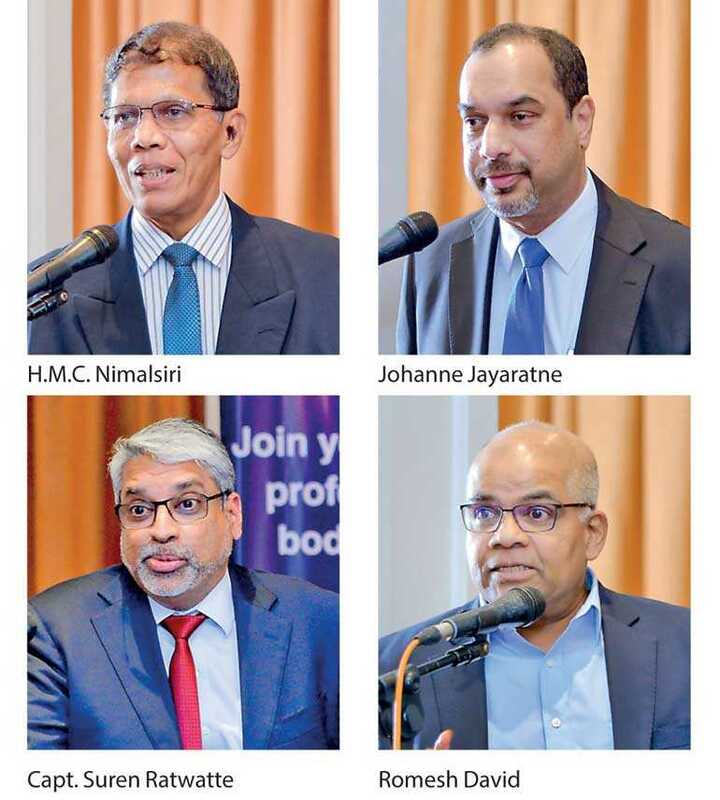 The Chartered Institute of Logistics & Transport (CILT) Sri Lanka held its first Logistics Leaders’ Evening for the year on 19 June, themed ‘Future Challenges in Aviation’. The event commenced at 5:30 p.m. with light refreshments and was held at the Victorian Hall of The Kingsbury, Colombo and was attended by over 150 participants from a wide spectrum of the industry. The eminent speakers for the evening were H.M.C. Nimalsiri, Director General of Civil Aviation and Chief Executive Officer, Civil Aviation Authority Sri Lanka; Johanne Jayaratne, Executive Director, Airport and Aviation Services Sri Lanka; Capt. Suren Ratwatte, Chief Executive Officer, SriLankan Airlines and Romesh David, Director, Cinnamon Air. Chairperson CILT Sri Lanka, Gayani de Alwis, CMILT during her welcome address stressed that CILT’s role is both passenger and goods transport in all modes of transport including aviation and urged all aviation professionals to engage with CILT to develop the industry. She also mentioned about CILT’s collaborative education offering with SriLankan Aviation College. Aside from the detailed overviews of the aviation industry as a whole, there were several common topics that were identified as challenges for the aviation industry and specifically Sri Lanka such as; the political instability and frequent policy changes, inadequate integration with other institutions for national level strategies, development of airport infrastructure lagging behind, travel growth resulting in traffic at Bandaranaike International Airport (BIA) already exceeding planned capacity, ground handling rates at BIA being reported to be higher than those at other regional airports, etc. However, some positive trends were also shared with global air travel numbers being better than ever before and that the Asia-Pacific region will dominate that growth (as seen in the below charts). Furthermore, the processing, sharing and distributing of data, be it internally to staff within an airport or direct to consumers, providing real-time updates on the weather, delayed aircrafts – any issues in general are allowing for better communication all around and more effective strategy planning moving forward. The theory is that the real-time updates integrated within an efficient management system are enabling reaction methods to real-time challenges to be drastically improved upon. What was most exciting were the insights into the future of the aviation industry such as Dubai airport to go passport-free with Blockchain Technology where inbound passengers will get off their flight and head to baggage claim, with the process of manual verification through waiting in queues eliminated. Also single token travel, facial recognition technologies, biometrics – whichever name you choose for the topic will have a huge impact. Single token travel looks to become a staple of air travel in the very near future. With extremely exciting developments such as the work Happy Flow is achieving at Aruba as well as releases at several of the major airports and airlines around the world all evidence the fact that there are significant investments in biometric technology everywhere. The speeches were followed by a very interesting panel discussion moderated by Kamaya Perera, Principal, KPMG Sri Lanka – Knowledge Partner of CILT Sri Lanka. The Chartered Institute of Logistics and Transport (CILT) is the leading global professional body associated with the logistics and transport industry. The Institute holds unparalleled international recognition and works towards achieving its objective of promoting, encouraging and coordinating the study of the science and art of logistics and transport through its membership, educational qualifications and other events. With a global membership of over 34,000 from 34 countries across the globe, CILT provides a professional identity to those in the ever-expanding logistics and transport sector. It is a strong, active and a unified professional association that is able to speak with authority on strategic issues affecting businesses and people in the industry and support their careers.